Dutch companies, TrofiPack/Trofi, and Van der Helm are planning a new distribution center (DC) in Den Hoorn, the Netherlands. 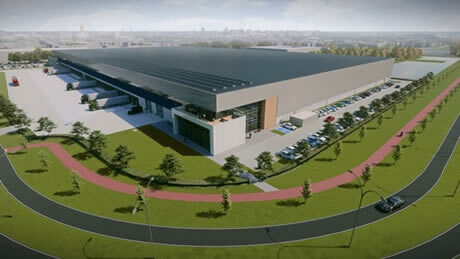 Van der Helm and Delin are having a 37.500m2 DC built. This DC is being constructed in the Harnaschpolder business park. This site is located alongside the A4 freeway. Packing company, TrofiPack/Trofi, has been operational in De Lier since October 2016. They are experiencing tumultuous growth and cannot expand any further at their current location. That is why it was decided to fit out 16.000m2 of the new DC in Den Hoorn specifically for TrofiPack/Trofi's current and future needs. This decision was made along with their strategic partner, Van der Helm. This means the Trofi Group can fulfill its wish to have all its activities under one roof again eventually. TrofiPack will have access to a refrigerated area large enough for over 3.000 pallets. There will also be ripening rooms with a capacity of 500 pallets. Also, the packing station will be equipped with all the necessary modern machines. This equipment will already be firmly rooted in the post-plastic era. One of the Trofi Group's Directors, Harry van der Hout, is pleased with this next step in his young firm's journey. "We will soon be at a strategic location. Over the next five years, we can keep growing. The expansion at Lier could not happen according to our vision." "We are, therefore, thrilled to be able to realize this new project, together with Van der Helm. The building is becoming exactly as we envisioned - for today, tomorrow, and for the long run", he says. Marc De Naeyer is another of this packing company's directors. He is also happy with the development. "The past two years have given our company a boost. Our retail programs are growing rapidly. With these larger facilities, we want to expand along with our strategic retails partners over the next five years." Richard van der Helm and his brother, Gerard van der Helm, run van der Helm. Richard says the new DC will provide about 200 job opportunities. It will be operational by the end of 2019. TrofiPack will move in during the first quarter of 2020.